Just because you can't walk doesn't mean you can't dance. Believe it or not, wheelchair dancing is an up and coming sport pursued by people with disabilities in 40 countries around the world, including the United States. IPC Wheelchair Dance Sport is a great resource that links internet users to the major organizations around the world that promote wheelchair dancing on both the recreational and competitive levels. Organizations such as Axis Dance Company and Full Radius Dance are helping to bring together the dance community and the disabled community by promoting change in how people view disability. Wheelchair users can pursue square dance, line dance, ballet, and jazz. 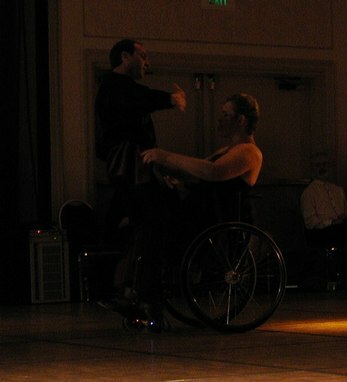 Additionally, Combi-dance style (a wheelchair user dancing with a non-disabled partner) allows people with disabilities to participate in standard dances, such as waltz, tango, Viennese waltz, slowfox, and quickstep, as well as Latin American dances, such as samba, cha-cha, rumba, paso doble, and jive. Duo-dance is the style where two wheelchair users dance together, and group-dance is usually wheelchair dancers and non-disabled dancers dancing in formations or free performances. 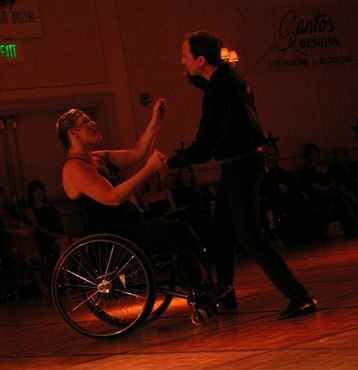 Also known as integrated dance, wheelchair dance has been in existence for over two decades. Integrated dance companies have been forming around the world since about 1980, and the first international dance competition took place in Sweden in 1997. In 1998, the first World Championships took place in Japan. In the United States, one organization of particular note is Dancing Wheels, a pioneer wheelchair dance company located in Cleveland. Annually, it presents 120 performances, in addition to activating comprehensive educational outreach programs comprised of lecture/performances, workshops for educators and healthcare professionals, and residencies. Full Radius Dance, a company located in Atlanta, has a Positive Motion dance program which caters to adults and children with disabilities and which focuses on the creative and artistic qualities of dance. In addition to wheelchair users, visually impaired people also participate in classes which help the students with directionality, following directions, balancing, and purposeful movement. It is first and foremost, a creative performing arts company which perceives disability as being only a secondary characteristic to graceful dancers. Aside from helping to integrate disability and dancing, wheelchair dance is a sport which provides its participants with inspiration as well as health benefits. Wheelchair users have reported feeling more confident and able-bodied, and some have even reported needing less physical therapy, due to the workout they get during practice and performances.